We are fortunate to live in a world that has cordoned off almost every day of the calendar year for some kind of drinking holiday. If we’re being honest, the reasons these days exist—like “National Drink a Beer Day” or “National Mimosa Day”—are simply to be used as tools of manufacturers and PR people to encourage greater consumption, but hey, we’re game to play along from time to time. Any excuse to taste something new is okay by us. And lo and behold, here we now find ourselves on April 9, 2019: National Gin & Tonic Day! Ah, the G&T. Noblest of the basic mixed drinks? We might be persuaded to say as much. Certainly, it’s one of the few things you can confidently order in any bar on Earth and be confident in receiving something that will be more or less palatable. 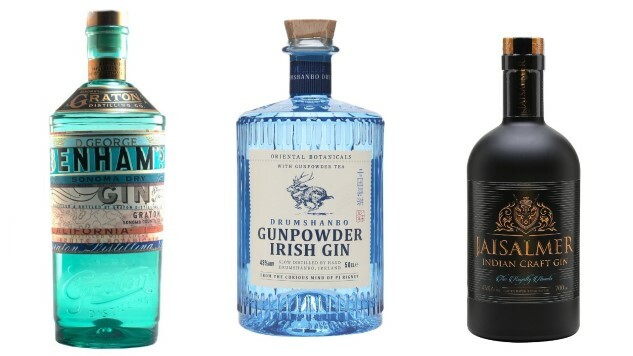 Even with the cheapest gin out there—and we’ve blind tasted all the best cheap gins, so we know—and bottom-shelf tonic, you’ll still end up with a drink that will do in a pinch. Upgrade your gin, though, and especially your tonic, and you have a drink that is fit for the most discerning of palates. Hell, we appreciate G&T Day to such a degree that Paste writer Amy Glynn also tasted six other gins for today. As such, we’ve tasted three craft gins for today’s auspicious drinking holiday, and are prepared to comment on how each will play within the confines of a G&T. On the nose, Benham’s comes off as initially sweet and perfumey, with some woodsy character and sweet notes of ruby red grapefruit and lemon meringue. Hiding under the citrus there’s also some slightly musty, more unusual elements that give it an herbal undertone—some “forest floor” earthiness. On the palate, I was initially taken by a rush of heat—this gin’s 90 proof is something you certainly feel up front, although it becomes a bit less bracing over time. Intense lemon fruitiness is chased by pine, warm chamomile tea, anise and spruce tips. It’s fairly sweet, but nowhere near as saccharine as many “New Western” gins, which I appreciate. Likewise, the sweetness is cut to a degree by a bitter, citrus pithy finish that develops after each sip. All in all, it still seems a bit hot, but this is a boisterous American gin that is clearly going for exactly that sort of presentation. Mix with tonic for: A sweeter, citrus-forward and lively G&T that certainly won’t be perceived as watered down. This curiously titled gin comes from Ireland’s The Shed Distillery, and is named for its use of Gunpowder Tea leaves, which are rolled into small balls and thus resemble grains of gunpowder. Of the three, it presents as the most classical of the gins—closest to a traditional London Dry gin style—while still carving out a bit of identity for itself. On the nose, Gunpowder immediately registers as more crisp and less sweet in comparison with the Benham’s, with classic notes of juniper pine and berry fruitiness, coupled with pink peppercorn spice. There’s a red fruitiness on the nose that almost makes me think of cranberry, which was an unusual thought. On the palate, my initial word was “resinous”—this gin certainly didn’t forget about the juniper. At the same time, though, there’s some very pleasant grapefruit citrus involved, and a melange of peppercorn spice. It’s a little bit sweeter here than the nose implies, but any residual sweetness is nicely balanced by delicate bitterness. In general, this is a very well balanced gin indeed—a lot of subtle flavors, with none particularly dominating, while also being significantly less hot than the Benham’s, despite coming in at 86 proof. In short: You could use this in almost any recipe that has ever called for gin, and it would fit perfectly. It’s the most obviously gin-like of the three, and the most instantly recognizable. Mix with tonic for: A balanced, platonic ideal of the G&T that would play nicely with a squirt of lime. This Indian gin comes from the large Rampur distillery, whose surprisingly pleasant single malt whisky we also recently tasted at Paste. As with the single malt, the goal here is to incorporate as many Indian botanicals as possible, which results in a fairly unique gin. Botanicals include a variety of Indian-sourced citrus and spices. On the nose, Jaisalmer immediately strikes me as the most unusual and off the beaten path of these three. This one is quite floral and slightly funky—grassy and herbal, with strong impressions of green tea, chamomile and caraway. There’s juniper there, but it’s being influenced much more strongly by herbal/spice impressions. On the palate, warm spices and herbal influences make themselves felt again. Cardamom, coriander and grains of paradise notes combines with respectable alcoholic heat to create a warm, prickling spice sensation. Juniper pineyness backs things up, along with lemon zest impressions, but this gin is ultimately defined by its spices in an interesting way. I’m not sure if it would be my go-to, but there’s probably someone out there who has been hoping and praying for a gin like this. Mix with tonic for: A warm, spice-accented G&T with an exotic twist. Jim Vorel is a Paste staff writer and resident liquor geek. You can follow him on Twitter for more drink writing.